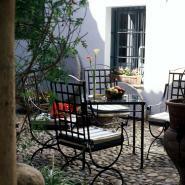 A sophisticated and stylish Andalusian patio. Located on a historical building in the tourist centre of the vibrant city of Seville, the hotel Las Casas del Rey de Baeza, is surprising due to the sophisticated and accomplished mixture of elements from the past with those from the present, as well as also reflecting the best that the Arabic and European styles have to offer. The contrasting balance between pure, immaculate tones of white and blue, with a few shades of ochre and reds, that are characteristic of the region of Andalusia, are notoriously present in every corner. The rooms reflect a contemporary ambiance invaded by natural colours that recreate modern and relaxing environments. The furniture take on a chocolaty hue and the floor is covered in stone. Through the air a warm intimate light wanders. The comfortable living room and the charming library are ideal for moments of rest or for reading. On the top floor there’s the delightful terrace, the perfect spot for refreshment at the relaxation pool with a magnificent view over the Giralda. A few steps from the hotel, museums and historical monuments beckon the imperative walks through the Barrio de Santa Cruz to the Cathedral or the Giralda. For dinner, enjoy great service and savour the unforgettable tastes of the region, a speciality of the restaurant at the hotel. Las Casas del Rey de Baeza is situated in the heart of the historical centre of Seville, in the Jewish Quarter. From Madrid, enter the city by the Kansas City street, in the José Laguillo street pass the station of Santa Justa on your right, once at the Hotel Emperador Trajano turn left and enter the Gonzalo Bilbao street. Afterwards take Puñon Rostro – Escuelas Pias and when you see the Santa Catalina church, turn left to enter Santiago Street, where the hotel is situated. From Huelva, head towards the centre of Isla de Cartuja. Once arriving at the bus station in Plaza de Armas, turn right to enter the De Torneo avenue – La Resolana, the Capuchinos roundabout – Mª Auxiliadora. This should bring you to the middle of Puñon Rostro – Escuelas Pias, once you see the Santa Catalina church, turn left to enter the Santiago street, where the hotel is situated. No extra beds for adults.